One of the most welcome books to appear for fans of weird fiction in 2003 was The Selected Letters of Clark Ashton Smith, published by Arkham House and edited by David E. Schultz and Scott Connors. Finally, the third member of the great Weird Tales triumvirate is revealed in correspondence. Talking about his stories, his relationships, his life, Smith is as fascinating as Howard and Lovecraft have always been in their letters. Although none of the letters Smith wrote to Howard are in the collection (presumably because they have not survived into the present day) Howard is nevertheless mentioned in several of the letters to HPL, Derleth, and others. Smith’s comments are perceptive and largely positive of Howard and his work, and they are surely of interest to Howard fans. Wright is certainly capricious in his rejections and acceptances; though I, for one, am the last to blame him for trying to please his public. But it seems to me that he makes mistakes even from this view-point. I thought the last issue of W.T. rather punk, apart from the verses, the frontispiece decoration by Senf, and one or two fine passages in Howard’s tale. I couldn’t stomach this last as a whole — that bloody battle stuff is so stale that it gives me what Sterling called “the Molossian pip.” Still, it was better than Hamilton’s current re-dishing of his immemorial moth-eaten plot, and the commonplace detective thriller by Quinn. Munn’s story was vivid and original in some of its detail, but I didn’t get much out of it as a whole. And even the reprint was pretty tame. Keep this low opinion of Howard’s blood-and-thunder in mind, because Smith would revise it later after corresponding with Howard and discovering the weird ecstasies inherent in his Conan tales. As for the problem of phantasy, my own standpoint is that there is absolutely no justification for literature unless it serves to release the imagination from the bounds of every-day life. I am glad that Wright took “The Carven Image,” and shall look forward to seeing it in print. His ideas of deadwood must be peculiar, considering the amount of it that he admits into the magazine. In the current issue, Howard’s “Worms of the Earth” seems to be the one real first-rater. The footnotes to this letter say that “Worms” appeared in the November 1933 issue. This is incorrect; it was November 1932. W. finally sent back “The Third Episode of Vahtek,” saying that he saw opportunity of using it at present, but might possibly ask me to re-submit it at some future time. Oh well. . . The current W.T. impresses me as being an excellent issue, apart from the banality of the cover. I like the tales by Howard, Eadie and Ernst, especially the former. Quinn’s tale was altogether too hackneyed. . . The Howard tale had been “The Tower of the Elephant,” and the “banal” cover had been by Margaret Brundage. As we will see, CAS was a champion of Howard’s Conan character, seeing the tales as extraordinarily “weird” in the best sense. Howard is a rather surprising person, and I think he is more complex, and is also possessed of more literary ability, than I had thought from many of his stories. The Conan tales, in my opinion, are quite in a class by themselves. H. seemed very appreciative of my book of poems, Ebony and Crystal, and evidently understood it as few people have done. Mull that one over for a moment, folks. Here we have Smith reevaluating his previous opinion of Howard as a fine writer whose work was too often marred by cookie-cutter plots of violence and battle. Suddenly, after reading some of Howard’s letters, he is beginning to see the thematic core of the man, and therefore the depth of his stories that was previously hidden to him. For Howard’s part, he is “getting” Smith in the same manner, which Smith is not used to and which surprises him, coming as it is from the Two-Gun Texan who he thought was shallower than that. It is my contention that for all their faults, the three great Weird Tales writers all understood each other’s greatness, they realized in their own lifetimes that the three of them were special. Whereas hopeless types like S. T. Joshi will go their whole lives without discerning the true undercurrents of these relationships and the fusion of their life’s work, despite writing thousands of pages of ostensibly illuminating commentary. I hope to peruse “The Thing on the Door-Step” when you get around to typing it. In spite of your disparagement, “The Festival” holds its place in my affections, and has an imaginative quality that puts it above the new stories in the current W.T. Howard has some fine romantic fantasy in “The Pool of the Black Ones”[sic]; and Long’s tale has the makings of more than a pot-boiler. With more concentration on development and detail, it would have been first-rate. I must re-read the story by Merle Prout. I liked the idea and some of the incidents; but certain crudities rather jarred upon me in the hasty perusal which I gave it. My own tale was chiefly conspicuous for certain scientific horror-touches, carefully accumulated; and if the idea of flesh-eating plants weren’t so hackneyed it would deserve a higher place. I find this a valuable addendum to my thoughts of the last letter excerpt. Namely here we see HPL having disparaged one of his very best tales, “The Festival,” and Smith stepping in to correct what is either HPL’s self-modesty or inability to judge his own work (probably the latter, a problem Howard often shared). Then not a moment after bucking up Lovecraft, Smith does some disparaging of his own story, as usual deeming the plot too overused. I think Smith is wrong to do so; plots are ultimately mere window dressing for the story. They are a dime a dozen, overused in every venue, yet tales achieve their uniqueness not from plot but from the author’s sensibilities seeping into the execution of the telling of the story. All of the Conan tales have fairly derivative plots, yet Howard’s focus on barbarism and the decay of civilization elevate those plots into something new, they say things that haven’t ever been said in quite that way, even as the plot looks painfully familiar to narrow-minded readers. Yes, I noticed W’s plural mention of The Black Book & Unaussprechlichen Kulten. Shades of Von Junzt! Of course, it was Robert E. Howard who invented this book and the book’s author, which have since become two of the most famous and popular invented aspects of the Cthulhu Mythos. I trust that Conan and most of the others on the circulation list fully appreciate the treat in store for them. The ms. goes forward to the Cimmerian monarch today. Howard Wandrei’s tale in the last W.T. was quite good and original, I thought. Conan, as usual, put on a very entertaining and imaginative show. Merritt’s “Woman of the Wood,” though excellent, impressed me as being somewhat overrated. The other tales in this issue were hardly noteworthy. I received also the new Not at Night anthology, Keep on the Light, and was struck by the immense superiority of the items taken from Weird Tales, over others which, I presume, are by British authors. Howard’s “Worms of the Earth” and Whitehead’s “The Chadbourne Episode” were the leaders. On page 275 in Letter #202, this one to R. H. Barlow dated November 23rd 1936. It is the first mention of Howard by CAS in this volume since his suicide five months earlier. This was the beginning of the end for the Weird Tales Golden Age. Howard was dead; Lovecraft was a few months away from his own death, and Smith would leave the field, devastated by the loss of his peers and bedeviled by his own personal troubles. I am damnably sorry to learn, both from your letter of last June and Ech-Pi-El’s more recent letters, the troubles and difficulties that you have been having. Such matters are beyond our control, and it would seem the misfortunes have a way of “ganging up” on the victim: at least, that has been my own experience. I have had enough grief, the past two years, to founder a dreadnought and am beginning to wonder if sea-bottom has yet been reached! Which reminds me, before I pass to other matters, that I greatly liked your sonnet-tribute to R.E.H. in the pages of our old standby. This sonnet, titles simply “R.E.H.,” appeared in the October 1936 number of Weird Tales. Barlow was a more careful observer of Howard’s end than most others at the time; Barlow himself would take his own life years later. Howard’s death startled and shocked me as it must have shocked everyone else. It is understandable but infinitely tragic and regrettable. . .Sometimes, though, the anticipation of an event is more unbearable than the event itself; and I wonder if Howard might not have pulled through if the nurse had been less frank. I admired Barlow’s memorial sonnet greatly. Your prose tribute, and that of Price, were fine. The news of Lovecraft’s death seems incredible and nightmarish, and I cannot adjust myself to it. . .it saddens me as nothing has done since my mother’s death; and, somehow, I can’t help feeling that it should have been unnecessary. [. . .] It is all too melancholy; and it would be no less futile than needless to expatiate on the loss to us who are left. Hastur is mentioned in “The Whisperer in Darkness,” in a listing of fabulous names that includes Bethmoora (from Dunsany) and L’mur-Kathulos and Bran (partially or wholly from R. E. Howard: though there is also a Bran in Celtic mythology). Writing is hard for me, since circumstances here are dolorous and terrible. Improvement in my father’s condition is more than unlikely, and I am more isolated than ever. Also, I seem to have what psychologists call a “disgust mechanism” to contend with: a disgust at the ineffable stupidity of editors and readers. I think that some of my best recent work is sculpture: and I find myself confronted with another blank wall of stupidity. Oh well and oh hell: some one will make a “discovery” when I am safely dead or incarcerated in the bughouse or living with a yellow gal in Cambodia. P.S. On glancing over this letter, I note a few asperities of tone, and, in places, a lack of Arnoldian “sweetness and light.” In extenuation, I must plead that I have been pretty much at the boiling point lately. I believe the late R. E. Howard and I would have had a grand time together lambasting civilization; that is, if I have not been misinformed as to his views. Barbarism, barbaric art, barbaric peoples, appeal more and more to me. I could never live in any modern city, and am more of an “outsider” than HPL. His “outsideness” was principally in regard to time-period; mine is one of space, too. My God, think of what might have occurred had Howard somehow survived, and after the death of Lovecraft he and Smith struck up a far more intense correspondence, making up for the loss of HPL with a stronger link to each other. How perfect is it to see how Howard influenced and inspired the likes of CAS as much if not more than those people affected REH. REH is generally seen as dispensable in the greater schema of the Lovecraft Circle. His views contrary to the cosmicism practiced by the rest of the group, he often is dismissed as a hanger-on of sorts, the Gilligan of the group. 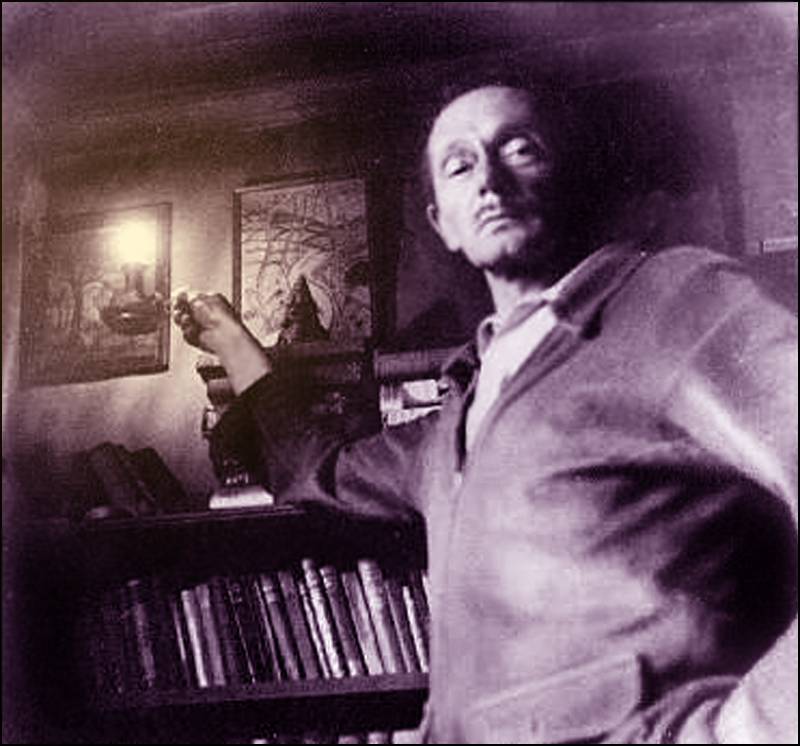 Don Herron has acutely pointed out in the past Lovecraft’s stellar use of Howardian action in his masterpiece “The Shadow of Innsmouth,” opining that HPL could never have brought himself to that great a boil without his furious correspondence with Howard fueling his creativity at the same time, subtly influencing his writing the same way traces of Lovecraft crept into Howard’s writing. Now, we get to add to that the wonderful fancy of Clark Ashton Smith slaving away on his curious sculptures that would become one of the famous cornerstones of his artistic legend, the whole time grumbling about civilization and thinking of Howard and his Cimmerians, those images ultimately affecting the primitive grandeur of the carvings. Wonderful. Glad to hear that the booklet impressed you so favorably. (Mr.) Claire P. Beck, aged nineteen, is the printer; address, Box 27, Lakeport Cal. . .He is desirous of bringing out a book of R. E. Howard’s stories, and also a selection of mine. So now we have word of a Mr. Claire Beck (1919-1999) (who ran an amateur printing operation with his two brothers, Groo (?!?!) and Clyde) wanting to print a Howard volume during the same time Derleth and Wandrei were desperately trying to get Arkham House off of the ground. As it turned out, Derleth and Wandrei were the Johnnys-on-the-spot, succeeding where so many other fans failed. But between this little tidbit, along with the cryptic mention in an OAK to Dr. Howard letter of someone possibly being interested in collecting the Conan stories and/or the Costigan stories circa 1937, and with items such as Paul Spencer’s plea to reprint Howard (currently in print in The Barbaric Triumph) thrown in, it’s clear that Howard was as viable a commodity as Lovecraft during those years, with only luck and the vagaries of the marketplace nudging Lovecraft into print first via Arkham House.